If there's one thing that the mobile gaming industry's going to be remembered for, it would its huge potential for wide appeal. Just about every type of game is covered on mobile, including impressive new 3D platformers, racers and FPS titles, an array of casual games, and even adult content (ahem.). The problem that some games have, unfortunately, is that no heart is put into the development, and instead rely on a popular brand to attract gamers, essentially making them "advergames" that really aren't worth anyone's time. The best example of this kind of false economy would have the mobile version of The Sims 2, released earlier this year- it lacked several features that had made the Sims name.. Ever since then, knowledgable people have steered clear of popular brand mobile games (with good reason, too). However, THQ Wireless deserves some commendation for the effort they've put into this pocket sized version of a truly "gangsta" game. The console version of Saint's Row, a huge slab of gamers would argue, virtually begs to be GTA. Its free-roaming design, huge game area and enormous collection of customization options and weapons available, not to mention the central "ghetto" theme were clearly influenced by the Grand Theft Auto series, only. Like in the latest GTA console title, San Andreas, several gangs occupy the city, and the gamer is tasked with carrying their gang to dominance by carrying out robberies, killings, and some occasional ho-protecting. The mobile version is really not all that different. Instead of trying to create a 3D version for mobile (which would've been cool but would've also been painfully slow on most phones. ), THQ Wireless cleverly concocted a twist on their 2D version. 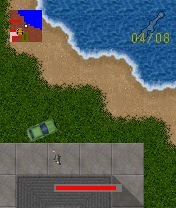 Instead of the strange, on-foot only game they had planned in the early stages, THQ decided to go with a top-down view, including vehicles and a full city (they couldn't mimic GTA more if they tried). The colour palette for the city is fairly muted, giving it a rather uninspiring look. It does, however, feature a fair collection of different buildings, which have clearly been thought over. Having said that, the pedestrians and cars are also quite detailed- to the point that you can make out male and female bystanders. The sound, on the other hand, is genuinely awful. The only sound you get in the game is the car door opening and closing and explosions. Not even a theme tune (for shame!). This does nothing for the game's atmosphere, making it much less ghetto than you'd imagine. Once you've picked one of four characters available, the game gives you eight regions of the city to explore, from Saint's Row itself to the docks. Each region is unlocked when you reach a certain level of reputation in the previous region. Your reputation is measured in points, which are awarded when you kill enemy gang members, police, win races or complete missions. Like the Xbox 360 version, the game only allows you to work for the 3rd street saints, who, once you venture to their HQ, will give you missions, varying from paying off a corrupt official to raiding an enemy gang member's territory with several other allies. Apart from doing missions, you can mod your vehicle at a garage, which will also pay you to bring certain vehicles to it- there are about six different types of car when you start the game, with more being unlocked when you unlock new regions. You can also participate in illegal street races in some parts of town, which could earn you big money and a boost in reputation. Finally, you can make a visit to your local gun shop, where you can buy anything from Uzis to flamethrowers, as well as ammo. Overall, I was rather surprised at the depth of Saint's Row on mobile. It doesn't look as good (or as "gangsta") as it should, but it offers several gameplay options, both single and multiplayer, as well as reasonable longetivity, which gave it some much-needed value. 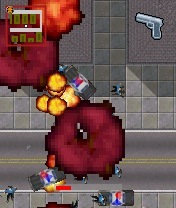 This is a good one to play while Rockstar start to think of re-releasing the early GTA's for mobile (please? ).